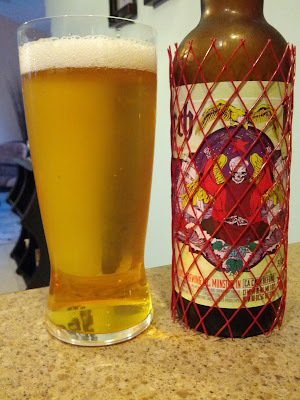 When I reviewed Rivertown’s Helles I went through the whole, very interesting, story of the history of the helles style so I won’t rehash that here but the name of this beer certainly is curious. Gorch Fock is the pseudonym of an author and the name of two boats, both of which were named in honor of the author. The internet seems void of exactly which one of these Gorch Focks 3 Floyds is honoring… or if someone at 3 Floyds made up the name unaware of the other uses. My guess, which will hopefully be confirmed somehow, is that they are honoring the author who wrote fishing-centric stories and poetry. That is more likely to me then honoring some old big 3 masted boats that did nothing particularly interesting. Though looking at the bottle art there are some big 3 masted ships on it as well as some whales and other sea/fishing type stuff… so it could go either way. Lets hope this beer is more interesting and find out just how “traditional” 3 Floyds can get, since they’re usually extreme. Produced a snow white head about a finger deep the reduced down to a skim layering of bubbles rather quickly. Bright yellow gold color matches perfectly to the style, remember helles means bright/light color in German. The smell is not very strong but what is there is grainy malts and a very low bit of hops. Smooth ultra-crisp taste just like Rivertown’s Helles. This is what I really like about this style, the crispness of it is very refreshing. Clean malt flavor and slight hop bite. That crisp mouth feel comes a quite a strong bit of carbonation. So much carbonation that it almost tickles my lips, in a slightly discomforting way. I feel kinda meh about this beer. It’s decent, but nothing amazing to write about and doesn’t really excite me in anyway. If you want to try a Helles beer I’d strongly recommend Rivertown’s over this. Also Rivertown’s is available year round (though best on a hot day after mowing the lawn) where as this is July-only.